Laughing and enjoying motion in spite of it all. Aging does not mean a person does not want to look reasonably good. Everyone cares how they look, though we might be limited by factors such as age, illness, body features. Please, don’t tell me you are only exercising for your health. I won’t believe you. You might try to say you “don’t care” what other people think, but that is probably over-stating it. It is good to care less than many people do, but we all choose how to present ourselves on a daily basis, one way or another. I do recognize that some people appear to have given up some aspects of their grooming, but experience informs me that it is usually from frustration rather than real lack of caring at all. Also, even with that supposed mindset, people do something to either fit in with a certain social group or express themselves with their choices. 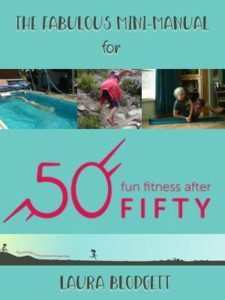 When it comes to being an over 50 year old athlete, for so I presume to categorize myself since I engage in regular exercise, one is somewhat freed from the pressures of youth, but while facing the realities of aging. There is no chance of looking like a fresh-faced model, so one can give up worrying about it, but one has to be ready to accept the decline that comes with that. That doesn’t mean you have to concede when your friends start talking about dressing “appropriately,” which I think means attempting to hide as much expanding girth or sagging skin as possible. It also usually includes boring conservative styles and colors – as a sign of humility. Or something. Not me. I aim for a very comfortable combination of carefree abandon and overtly cheerful in both my movement and my attire. I am going to be active, so my clothing must adequately accommodate that, but color and form are meant to be enjoyed; and I enjoy them with what I wear. It is not my aim to shock people, yet neither am I concerned if they choose to be shocked. At my age, things are shifting and wagging, but there is no logical reason I should be dressed to hide it for someone else’s visual “comfort.” I have weather, maneuverability, and fun factors that are much more important to me than whether or not someone sees my over 50 year old belly or has their own “standards” for appropriate. There are so many opposing standards…. Really, I want to be a good role model. However, I want to be a role model who is content and happy with who I am and the effort I am making. I want others, old and young, to be encouraged to “fly free” as well. Free to look less than 20something photoshopped. Free to post photos where they are laughing so hard their face is contorted. Free to wear functional and fun short skirts and spandex pants. Free to dance barefoot for both maximum stability and twirling. Free to be so full of joy that people are inspired to wonder why and how. Let function and fashion meet in a blend that fulfills personal needs and desires without unnecessary self-conscious concern for what can’t be changed or how the self-appointed fashion police are looking at us. She is used to treating adults with respect and some deference, but there was a presumptiveness of parental authority in his corrective tone that prompted her to say politely, but with some consternation, “Why? My mother comes in here all the time barefoot.” He was accusatory of not only her bare feet, but her obedience in general, like she was a rebellious teenager. Thus, my daughter, one of the kind of people who goes out of her way to make other people feel welcome and part of a group, came home consternated with this brush with the not uncommon rudeness of people at large. As is usual with such an unpleasant encounter, we reviewed future options for responses. Then, I recalled that I was getting ready to to out on some errands and Walmart was on my list! I had mentally planned my route to go there last, maybe a couple hours into my trip. Now, I thought, I should try to go straight to Walmart and see if the same fellow was there. It was not that I was looking for a confrontation. Although I don’t mind at all talking about my choice of a barefoot lifestyle, I don’t look for confrontations. I also realize that there is more risk of censure if I bring a lot of attention to it in ways that challenge other people in ways that stimulates them to establish rules. Still, I wanted to back up my daughter and to do something that made her feel better about her reputation. He would SEE her mother go into the store barefoot. It was pouring rain and around 41°F that morning. The shopping trip goal was to find items to fill Christmas stockings, so I was going to be doing a lot of exploring of unusual aisles in the store, looking for creative ideas. And I would need a cart. As I entered the front door, I glanced toward the greeter. It looked like the same man. His back was to me, as he was busy closely inspecting departing shoppers bags with a thoroughness I had not seen before. There was even someone waiting in line to be inspected, something else I have never seen at a Walmart before. I would have to inconspicuously loiter and enter slowly. I took my time choosing a cart, then I meandered over to the handy-wipe dispenser at the slowest pace possible. His back was still turned, but he was on to harassing the next person in line. I took two wipes and began to wash the cart handles. I surreptitiously glanced up to see if he had turned around. Not yet, so I kept washing the shopping cart. Other people grabbed carts and passed by, while I gave the upper regions of the cart the most thorough washing it has probably ever had. Still, he did not turn around, but engaged in a brief, chatty conversation with someone that he seemed to know who was leaving from in front of the line of checkout stands. Sigh. Not being inclined to get down on my knees to wash the sides and wheels of the shopping cart, I scoped out what I might shop for in that immediate area. I am not often enticed by deals at the door, and for good reason, but this time they at least had some Christmas wrapping materials over nearer to him. I slowly circled that way, hoping that maybe more movement on my part would do the trick. I seemed to be invisible! I was surprised to find that I liked some of the cheap, pop up boxes for making wrapping easier. I put some in my cart, but he still wasn’t looking. I shopped there some more, trying to move some constantly without actually going very far. I chose a different package and put the other back, added some transparent tape to the cart, and looked up again in his direction. All I could see was his back. The day was beginning to get away from me. There was no way of knowing if he had ever glanced my way and seen my bare feet. Would it occur to him that I was that “young lady’s” mother? She is the youngest child of 7, so I am technically old enough to be her grandmother, but the bare feet should have been a huge clue. I decided to get on with my shopping. I went on shopping all over the store and in nearly every department. I saw plenty of employees. I even had to ask for help once. I stood by the checkout stand in the electronics department for quite some time choosing items and there was lots of employee activity around there. I wasn’t hiding from anyone or darting around corners only when the coast was clear. I noticed a few customers hazard a look at my face after noticing my feet. Their final facial expression was usually one of confusion, since I looked “otherwise normal” to them. The truth is that I have been in Walmart barefoot innumerable times over the last 3 years. Once, I was in the automotive department with my husband when a cleaning lady needed help holding a door open to get back in from the garage area. As I held it open, trying to stay pinned to the wall out of her way, one wheel of the metal cart ran over one of my big toes. I think I grunted in discomfort. She was very apologetic. One of the mechanics was going by and playfully teased her about what she was doing to the customers. They all saw my feet. We all laughed, and I went on shopping. There have also been a few checkers who have asked me or my daughters about our bare feet, simply in curiosity. They seem to intuitively know it is healthy and comfortable. One other time, another daughter (the 21 year old), was “told” by a worker in the aisle that she needed to get shoes on. She acknowledged his comment and went on shopping. He apparently felt better just having said that, officious or something, and went back to what he was doing. She didn’t have any shoes and had heard that random store employees are known to say there are laws and policies when there are not. How does a person catch cold? What do people mean when they say you can catch cold? And does running barefoot in cold conditions cause a person to catch cold? The concern sounds a lot like the once common viewpoint that taking a bath causes sickness, especially in the winter. And, it is noteworthy, that both concerns are basically built on the same premise: That exposure to lower temperatures causes illness. There is only one clear factor in getting sick. Exposure to pathogens through other people. Even with that given, not everyone gets measurably sick or shows symptoms to the same degree, thus there must be other variables. But is going barefoot in the winter one of them? Most people would agree that there are things that tend to lower a body’s resistance to fighting off germs, from personal experience and observation. But even those things are not sure indicators and often get distorted by superstition. For instance, being excessively tired is thought to predispose one to getting sick, and for me there seems to be a pattern of this occurring. Sometimes. There have also been a few times when my family needed me to not get sick and I didn’t, though through no mental powers of my own, because I wasn’t even thinking about it at the time. One example was when several other people in the family had a delirious fever, long lasting, and progressing from one person to another over about 6 weeks. I never showed signs of illness. This was even more noteworthy, because I am usually one in the family that gets the sickest for the longest. And believe me, I was tired for those 6 weeks! Lack of proper nutrition or food of questionable quality are thought to lead to sickness. There again, it seems to be depend. My husband seems to be able to eat anything and not get sick. We have not taken this to extremes, but he will not give up on “aging” food as soon as I will. He has finally conceded that consuming such food IS likely to make me have unpleasant repercussions, but he still wants to eat these items. On the other hand, I am much more consistent in eating a balanced and nutritious diet than he is, and it hardly seems fair that I am the one who tends to get the sickest! There does seem to be a pattern that more people get sick at certain times of year. Is this because of people being exposed to cold or because the germs get activated in certain environmental conditions? Or, is it because people are indoors, in less fresh air, when there are colder temperatures? Even with something like tuberculosis, all we have are correlations that boil down to the same basic issues of sanitation and overall health. And even then, not everyone succumbs to the same extent. And, again, one of the “strongest” correlations is how many people are breathing the same warm air in a closed space. To say that exposure to cold causes illness has one major problem. Cold is a subjective sensation. It is moderated by such things as body mass, activity level, and adaptation to climate. We have all seen the person from tropic regions wear a parka in weather where the natives of a region with winter are still wearing shorts and flip-flops. Then, there are the times when we all go outside dressed in layers of warmth, only to strip them off for comfort as we generate heat from chopping wood or skiing. Does that stress the body, to have the pores open, and even sweating to rid the body of heat? Would it rather not stress the body to not let it cool off when it obviously needs to? To be thorough, let’s ponder whether or not exposure of a certain body part is more likely to stress the body than exposure of another. Specifically, do bare feet touching the cold ground stress the body so that germs more easily overpower the immune system? Would this be anymore of a stressor than the nose breathing in cold (fresh!) air and needing to warm it? Is it worse than the hands being exposed or the head being uncovered? I’m sure everyone has their biases, but there seems to be a lack of consensus due to lack of real evidence. Even among the “experts,” you will be hard pressed to find agreement, but here is one website that talks about cold and colds. I suggest we let people decide how they are comfortable in certain temperatures and leave it at that. Speaking of comfort, there are properties of regularly bare feet that those people who wear shoes may not have thought of. The regularly bare foot has increased circulation due to more active muscles. With the whole foot being much more engaged, those muscles are doing the work they are designed to do and this produces heat. There is also the increased padding that develops on the bottom of a regularly bare foot, particularly if it is bare outdoors, where there are rougher surfaces to stimulate it. There is also the nice, leathery sole that a regularly bare foot sports. This still allows for proprioception and balance, way beyond what anyone gets through footwear, but regularly bare feet are insulated by this. All of the skin on the regularly bare foot is exposed to air more and this leads to a firmer skin. It is no longer kept all moist and gooey inside shoes, the perfect environment for germs to grow, by the way. For reference, the skin on the face is almost always exposed to air and it is still soft, but firm. If being barefoot in colder weather helps a person to be more active, then there is a good chance that it increases overall health and actually boosts the immune system. Sure, everyone needs to be aware of testing unfamiliar temperatures and conditions, but bare feet have a chance to become strong in ways that feet in shoes cannot. Since feet are the foundation of getting around for most people, one could wonder if bare feet, even in the cold, lead to healthy bodies. Four years ago, I adopted a predominantly barefoot life style when I realized the important health benefits of letting my feet function properly, and how detrimental most shoes are. Not only do I do things like my yard work and grocery shopping with bare feet, but most of the year I run with bare feet, having recently accomplished a 20 mile barefoot run as I prepare for a marathon. Throughout my day, bare feet allow me to keep my balance better, help avoid back and knee pain caused by deforming and confining shoes, and generally make locomotion easier and more pleasant. Last night, I volunteered at the Idaho Shakespeare Festival and was told that if I did not put footwear on, I would be “replaced.” I answered all the concerns about my bare feet, from safety to professionalism. However, the Festival person training me saw fit to turn me in to a higher Festival manager, who spoke with my friend who had coordinated the volunteering. Since I was there as part of a team, to do that friend a favor, and I thought that to present my case more fully to your management at that time would have been hard on my friend, I unhappily found some sandals. And I sat at my station as a bouncer at the assisted access door near the ticket counters to watch all the horrendous footwear that people had on. Needless to say, much of it was quite unsafe, both imminently and long term. A variety of two to three inch high heels were obviously unstable as the patrons clipped precariously by. The thick, wide “athletic” shoes limited how the foot could bend and kept people from being able to sense the ground, so they appeared to be pounding as they propelled themselves by sheer will. Flip flops and other loose sandals made wearers look like they were constantly guarding against tripping and slipping. Almost everyone looked awkward as they subconsciously fought with their foot wear in order to walk. Toes were squished inside, keeping them from splaying out effectively for shock absorption and balance. I wondered about the traction on the bottoms of many of the shoes. Picturing all of the cement steps, plus slanted, slippery lawns inside the amphitheater, I had to wonder why the Festival management was not more concerned about all of those poor people as a liability, rather than me. I had tried to explain that, not only do I watch where I am walking with my bare feet, but that my soles are leathery. I have accidentally run through broken glass a few times without trouble. When I do get the occasional abrasion or cut, just like people do on their hands sometimes, I take care of it and continue to appreciate the overall core strength that living with bare feet has helped me develop. I am careful with extremes of hot and cold, because they are my feet. I don’t expect anyone else to be making decisions about how I take care of them. Then I realized that many of the theater patrons go lay down and have their hands all over the grassy slopes! Where was the liability concern about this? What if they sit on or put their hands in glass? What about other issues, like making sure people had adequate cover from the sun or cold, or were protected from mosquitoes and potentially West Nile virus? Not to mention complete lack of walkways on the upper, highly sloped grass areas, making tripping a real possibility. What about helmets in case of a fall? What about some of the skimpy and nearly transparent clothing I saw, that might lead to offense or exposure. Yes, I jest. I do not want anyone else bothered with being told what to wear. Two other aspects of bare feet that often come up, before people become aware they have been unduly affected by shoe marketing and myths about the “necessity” of shoes, are 1) cleanliness and 2) appropriateness. As for cleanliness, I can assure you that my feet are washed much more regularly than most people’s shoes. I shudder to think what is on both the inside and outside of most footwear. And my feet don’t stink from being kept in a sweat box all day. Regarding appropriateness, everyone could basically see just as much of my feet in sandals as they could bare. How much difference does a couple of straps make? Have you ever stopped to wonder why footwear is too often associated with “professionalism?” Was it just a way to keep poor people from entering certain circles? As such, it comes across as quite snobbish. I had expected that an establishment that prides itself on expression and exploring the preconceived ideas in society would have been more open to my freedom to choose what to wear on my feet. It is a simple thing. It is a personal choice that has no impact on anyone else, other than what they choose to be offended by. I hope that my perspectives presented herein will lead to a change of policy and that I can add you to my list of places that I can tell others are barefoot friendly. Please note that I will be publishing this letter, as well as any response I get from you, on my blog, where I write about the benefits of being barefoot and chronicle some of my encounters along the way.